You are off for a weekend with the family and sometimes the food portion of the getaway results in a “Getaway” from the plan. Worth it? You tell me through this example. Three meals, zero snacks. We are walking around a lot today so we can justify this. IHOP, the host restaurant at the hotel. We haven’t eaten there in years. I will stay tight and have an omellete and maybe just a few pancakes. Cheesecake Factory, a restaurant that is not in our area when we are back home. We absolutely need to eat there. I just won’t eat the bread or have dessert. For dinner, what can we say, we are on vacation. I will have a salad and a potato and keep the meat lean. What’s the damage for the day according to the picture’s stated calories? 7000+ Calories. This is not including the beverages or any little munchies that you don’t calculate throughout the day. Thats enough calories for an average person for 4 DAYS. That’s JUST ONE DAY of holidays. We can justify anything. Yes you are on holidays, but if you define your enjoyment by overindugence and then expect a lean healthy body, that’s just wishful thinking that will never be realized. 1) Meet your protein needs. 0.8-1.5grams protein x lean muscle mass. If you need help with calculating this let me know. The variance is dependent on activity levels and goals. Need 100g of protein in a day? 2) 75 percent of your carbs should be packed with quality micronutrients. That means you should be eating vegetables, fruits, quality carbs in their least processed forms. 3) 25 percent of your carbs are there to meet your calorie needs in a way that will satisfy any urges and/or the convenience factor. Ideally you should have 100 percent carbs of the highest quality with the most micronutrients but life isn&apos;t always that way and this 25 percent buffer most likely gives you a 200-250 calorie leeway to have that tortilla wrap or protein bar. Non-exercise activity thermogenesis (NEAT) is the energy expended for activities we do that is not sleeping, eating or sports-like exercise. This would include activity from the energy expended walking around, performing yard work and other household chores, taking stairs, playing with the kid or a pet and grocery shopping. Even seemingly small physical activities increase metabolic rate substantially and it is the cumulative impact of these many actions that culminate in an individual’s daily NEAT. This may seem so trivial, yet a friend of mine keeps track of his movements through his iphone. What he noticed was that, throughout the day, through yard work, walking the dog, hanging with the kids, and taking the stairs versus the elevator at work, he logs approximately 10-15km of activity every day. This accumulated energy expenditure has a dramatic effect on your metabolism, helping you get leaner without setting aside time to “exercise”. Your task this week? Burn more calories by adding some productively busy chores, tasks, and leisure activities throughout the day. The Sport of Bodybuilding: Is this the Answer? Bodybuilding as a sport, where the athletic component is measured and factored into your score (8 lifts, accounting for all major muscle groups, with a 12 rep range), and symmetry is gauged objectively by a 3D scan? No crazy tanning costs or suits expenses. Membership fees are kept low. You are not at the mercy of judges nor is an artistic posing routine required? Typical bodybuilding contests don’t measure the work required year round. You show up to the event in a less than optimal state of true performance having obtained that “shredded” look. Then you step on a stage and get compared by who???? Are some judges truly qualified to judge the diverse classes now at contests? At some shows, you are just a number, waiting the entire day and night for your subjective placement at the end of the evening. Understand that I love bodybuilding and appreciate the art of posing and presenting your body. However the state of bodybuilding is in disarray, with bodies morphing to unsightly levels, testing even in many natural organizations thrown to the wayside, and new categories to evaluate the physique popping up left right and centre. There’s at least 8 different organizations that I can compete in and at least 4 different categories. 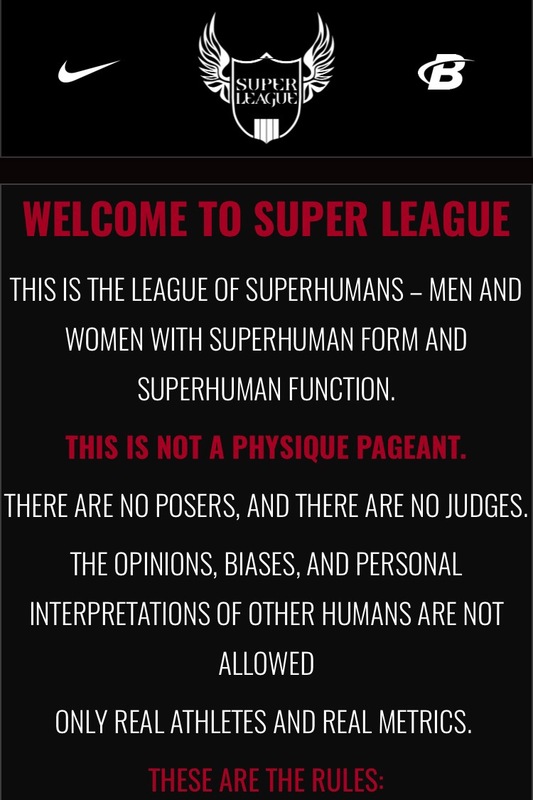 Is the Super League of bodybuilding, with Dorian Yates as its President and Nike and Bodybuilding.com behind it worth a look? The end of July will be a showcase of the first Super League event. Perhaps they are on to something.